Sorry, we are currently sold out of '140 Mixed Agates & Jasper Rondell Beads'. Please check back later. 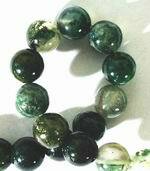 Sorry, we are currently sold out of 'Polished Web Agate Chunky Rondelle Beads - Red & Green'. Please check back later. Sorry, we are currently sold out of 'Frosted Celeste-Blue Agate Matte Beads - 6mm'. Please check back later. Large 12mm Faceted Deep-Rainbow Agate Beads - Heavy!